BrandVak Incorporation is a Retail and Shopper Marketing Company helping brands develop their Brand Presence stronger at Retail, whether it is in terms of Visibility, Communication or Shopper Experience. Our whole objective is to help Product Brands and Retailers alike to create a connect with their shoppers at Retail and build a brand without spending huge monies on TV ads, Print media, Hoardings etc. With the development of organized retail in India in the last few years, there lies a huge potential for brands to explore the idea of intelligently communicating with their shoppers at the Point of Sale where the purchase happens and that is the Store. At BrandVak we look at Shoppers. So who are shoppers? Shoppers are your consumers in shopping mode. 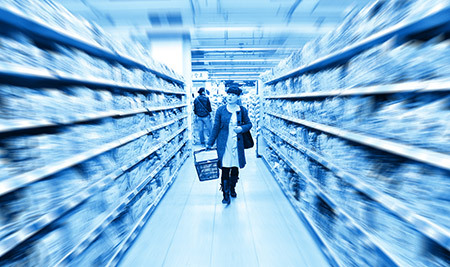 A consumer behaves very differently in a shopping environment than being exposed to brands outside the store environment. Internationally, there is a lot of Shopper research being conducted to gain insights on shopper behaviour and channelizing brand building strategies accordingly. Hence BrandVak brand delivery promise also says "We make your brand speak at Retail"
BrandVak Inc is one of the first focused Retail and Shopper Marketing Companies in India and we are proud to have been able to create a niche for ourselves. Traditionally you have the Advertising Agencies who's thought process always starts from a TV Ad Campaign and you have the BTL (Below the line agencies) who are the guys who offer brand promotional services. There are other Boutique design agencies that are more focused on logo design and graphics. But there is a huge gap that exists in the market between these two spectrums on handholding a brand at Retail. Majority of the SME Product Brands and Retailer Brands do not have the bandwidth to invest in TV Ads or expensive print ads or hoarding at the initial stages of brand development and you hardly have any ROI measurement on these investments. So here is an opportunity to develop the brand at the Retail Store level with the right brand exposure to your shoppers and differentiate yourself at the shelf level at a much reasonable cost and this investment is much easy to track on the effectiveness. We handhold a brand as an End-to-End service provider from developing their Go-to Market Strategy, Concept Development, Design Development and Implementing the Strategies to be able to Measure their effectiveness at retail. In-fact, we are working more as an extended marketing arm for brands where we work with them on a collaborative approach to partner in their growth. As a Retail and Shopper marketing partner, we also work in integrating the right skill set required for the brand to offer strategic inputs.